Filmora Video Editor Review: Pros, Cons – Is It Worth? Filmora video editor is a simple to use yet powerful video editing program for creating stunning home movies and attractive marketing videos that anyone can learn how to use it quickly. Read our detail review of Filmora Video Editor in this article to understand more about it. First off, Filmora video editor (formally Wondershare Filmora) is an easy-to-use video editing software that anyone can learn in minutes. Yes, simplicity is the key point of Filmora Video Editor. While other software is becoming more and more complex due to the addition of new features, Filmora video editor kept its user interface clean and intuitive yet offering easy access to the functionality of the program by very big navigation buttons on top of the timeline. Secondly, despite of its intuitive user interface, Filmora video editor has everything you need to turn your raw footage into stunning movies like any other professional video editors on the market. It lets you cut, trim, rotate video and apply filters, add title and transitions easily plus tons of special video/audio effects. This program also support 4k editing, has Chroma key, 3D LUT and audio mixer for those of you who need advanced video editing features. Thirdly, Filmora video editor is not a completely free video editing software like what you have been told. This program will leave a huge watermark on the output when you’re using its free version. To remove it, you’ll need to purchase a license at $59.95 per lifetime. Finally, Filmora is compatible to both Windows and Mac. It’s lightweight enough to use on low-end laptop/ desktop without any lag issue. Filmora’s video exporting speed of this software is relatively fast. We used a Core i7 Dell XPS 13 laptop without separate graphic card to test this program, and it works just fine. It is a good video editing software for beginners who want to create attractive videos. It has all necessary tools to edit video and plethora of effects in the library. It has a smart video editing workflow that beginners can follow up easily. That’s not to mention hundreds of YouTube tutorials you can watch too. The program comes in with advanced 4K editing capability and easy to use filters and effects that beginners may love it. The license price is good compare to what they offer. Lack of some advanced video editing tools for professionals such as advanced audio mixer, 360 video editing and motion tracking. Video rendering speed is not the fastest one on the market. Once you launched the program, you can start your project by choosing an aspect ratio. Then access to Full Feature Mode if you want to get full control of the program. For faster video creation, choose Simple Mode, Instant cutter or Action Cam Tool. This option allows you to create a video quickly but gives you less control on your project then Full feature. By choosing Import, you will have some options such as: import media files from your computer, from camera or smartphone as well as recording video option. There are dozen of input formats which will be listed in the next part of this article. Then you’ll need to select one of its 6 type of theme, then add back ground music and opening title and closing title. Finally, preview your video and export it and you’re done. In this mode, you don’t need to do anything with the videos (or you can’t do any thing, in fact). The work flow is as simple as 1-2-3-4-5-6 as I marked in below picture. For me, I often ignore this option. This option allows you to access to full editing options. It is a classic video editing style like many other professional video editing software where you can switch between Time line or Story board view. The interface is quite simple and intuitive. You can choose dark or light skin depending on which one is good for your eyes. All the basic editing tools are positioned above the timeline so that you can easily use them without walking around the menu bar. If you want to use some advanced editing features, you can right click on the video/audio tracks and choose the function you want to use. 5. How to edit a video with Filmora video editor? As I mentioned earlier, to start editing a new video project, you’ll need to choose an aspect ratio and pick one of the options at the start page. To access full control of all the features, click Full Feature Mode. Now you will be redirected to the working place as your can see at the above screenshot. For Filmora new users, I highly recommend you watch this detail tutorial to know how it works before you download the program. Once you downloaded and installed the program, you can use all its pre-built templates, including Titles, Filters, Overlays and Transitions inside the programs. These templates can be easily drag to the timeline to transform your footage. For normal use, these effects are more than enough. However, if you need some special effects to make your video stand-out, you can go to Filmora effects store to buy an effect package. The More Effect button is located on top right of the editor. 7. Export video with Filmora – Fast or Slow? Once you finish your editing work, you can save your project into your computer or render it to many kind of output formats, devices or share your video directly on YouTube, Facebook or Vimeo. Filmora video editor is not the fastest video rendering software we’ve reviewed. By the way, it’s not the slowest one. What’s a pity that Filmora only lets you render one file at a time. There’s no batch rendering option in this video editor. Filmora free version can be used for trial only. This version will leave a huge watermark on the output. Out of that, it’s free to use without any restriction. All the features are available in this version. 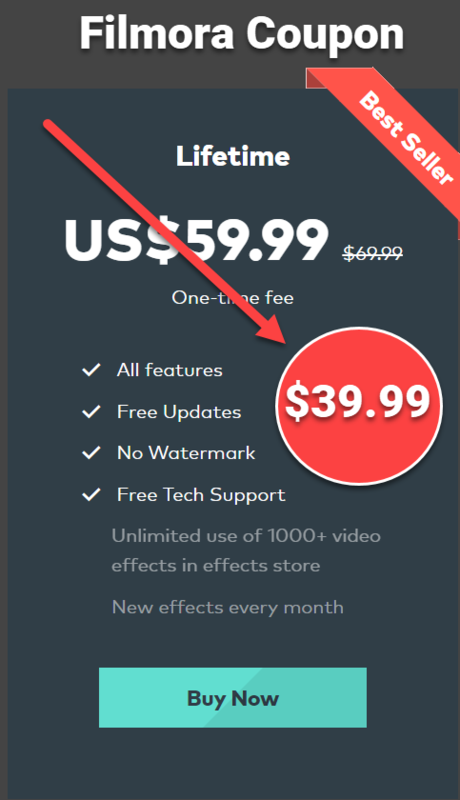 Filmora video editor has different pricing plans for personal, business or students. The price for lifetime license is around $59.99 which is very competitive in consideration of its features. This price is applied for both Windows or Mac user. Click here to view Filmora Pricing plan. 9. Finally – Should You Buy It? The answer depends very much on your needs and your budget. If you need a easy-to-use editing program with competitive license price, Filmora is the right option to go. For those who need special video editing features such as motion tracking or 360 degree editing, it’s not the one for you. If you have any question about this program, don’t hesitate to contact us any time. Don’t forget to follow us to receive more valuable post notifications in the future. Top 5 Free Alternatives to Filmora Video Editor.